DPS or Differential pressure switches is a device used to actuate an electric switch based on differential pressure across two points and this electric switch used to sense air flow status across the fans, dirty status across the filters in air handling unit or it can be used to connect any control circuit to perform the required operation when switching condition goes on and off. Range – The span of differential pressures or flow rates within which the sensing element of a given switch can be set to actuate an electric switch. Set or Actuation Point – The exact air pressure or flow rate which will cause the electric switch to actuate. Rated Pressure – The maximum pressure that the actuating components of the switch in contact with the media can withstand continuously and/or repeatedly without risk of permanent damage. Maximum Surge Pressure – Safe pressure for the switch housing but which may damage the mechanism by the continuous or repetitive application. Normally Open Switch – A Switch in which the contacts are normally open. Actuation closes the contacts. Normally Closed Switch – A switch in which the contacts are normally closed. Actuation opens the contacts. Single Pole Double Throw (SPDT) Switch – A switch combining both normally open and normally closed switch contacts. Null Switch – A floating contact switch with a zone of no contact. Often used to operate reversible motors. Repetitive Accuracy – The ability of a pressure or flow switch to operate repetitively at its set point under consistent conditions. 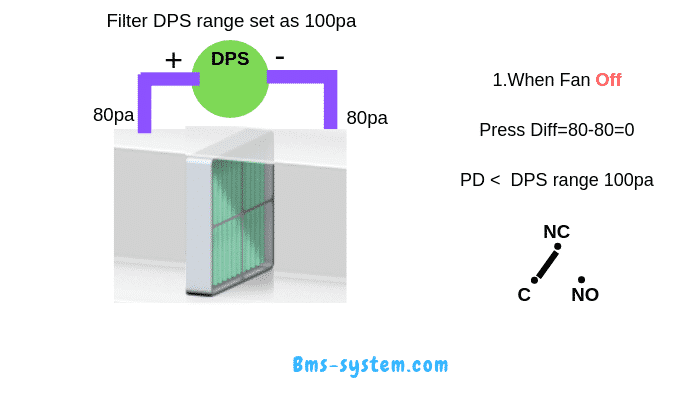 DPS is installed across fans in order to identify actual fan running condition by the pressure difference so, DPS positive tube must be installed after the fan or say positive side and negative tube to be installed before the fan or open to the environment or say negative side and pressure range selected as 100 pa for DPS. 1. 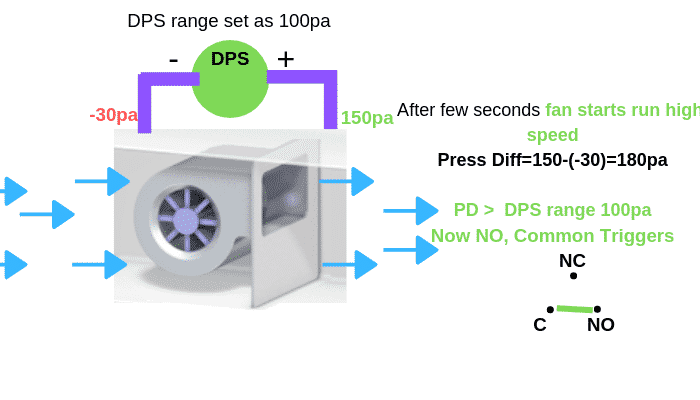 Initially when a fan at off condition, before the fan and after fan will be same pressure, so there is no differential pressure across before and after the fan.here pressure differential pressure or PD is zero. so here still NC and C remain the same. PD=60pa still lesser than 100pa(range). 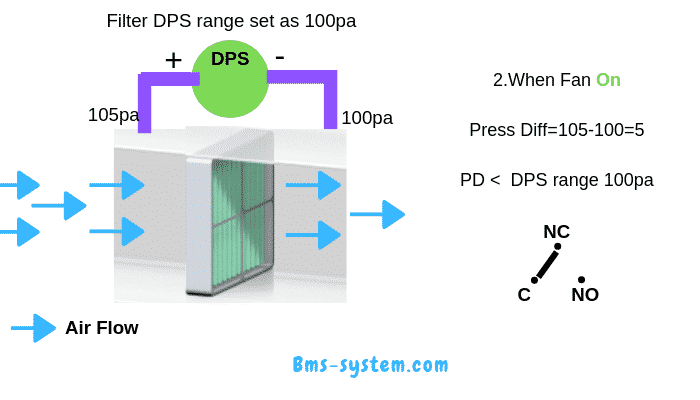 PD=180pa which is greater than 100pa(range). so here DPS triggers NC to NO and C.
This signal will be connected to BMS controllers or any other control circuit to perform the required operation. However fan running condition can be monitored from relay contact of the motor control circuit panel, but here DPS is used to know the actual fan running condition by confirming flow across the fan because from the motor panel will trigger the relay but not know whether fan really running or not, sometimes motor belt damage. DPS is installed across the filter in order to identify filter dirty condition by the pressure difference so, DPS positive tube must be installed before the filter or say positive side(when dirty particles get into the filter, pressure will increase here) and negative tube to be installed after the filter say negative side and pressure range selected as 100 pa for DPS. 1. Initially when a fan at the off condition, before the filter and after filter will be same pressure, so there is no differential pressure across before and after the filter. here pressure differential pressure or PD is zero. PD=5pa still lesser than 100pa(range). PD=90pa still lesser than 100pa(range). 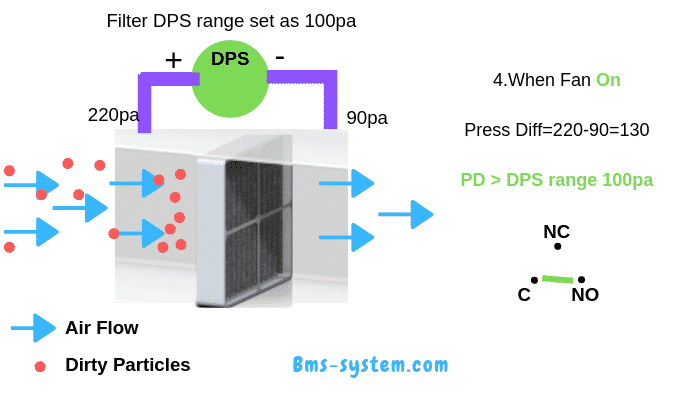 PD=130pa is greater than 100pa(range). This signal will be connected to BMS controllers and report as dirty signal for filter or any other control circuit to perform the required operation. Thanks a lot Mr. Hamza for explaining the working in the best way. This really helped me to clear all my doubts on DPS. Looking forward for your next topic.